Names, dates, materials and purposes please? (1) This is, of course, a snuff box. The little man's back hinges open about at shoulder level, revealing a cavity for snuff. 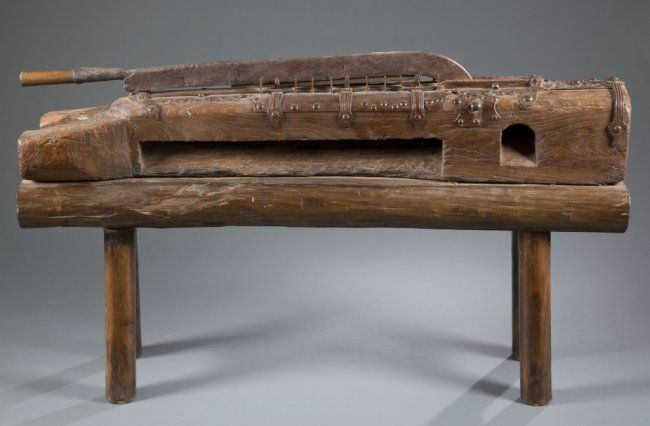 These items are usually French and date from the first half of the nineteenth century. (2) Wrought iron fire shovels, eighteenth century. 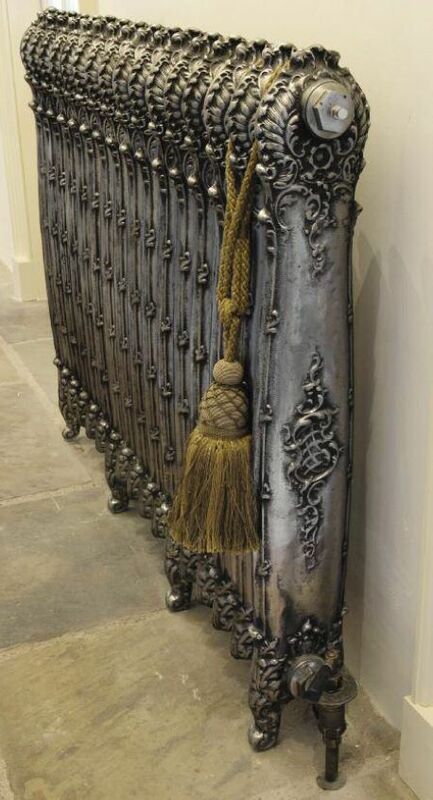 (3) Very fine central heating radiator, in iron. Around the mid/late nineteenth century. (4)Gold and pearl (large irregular pearl) . Given my usual rule of thumb - it is probably a snuff box. 18th/19th century. (6) This is a snuff box. 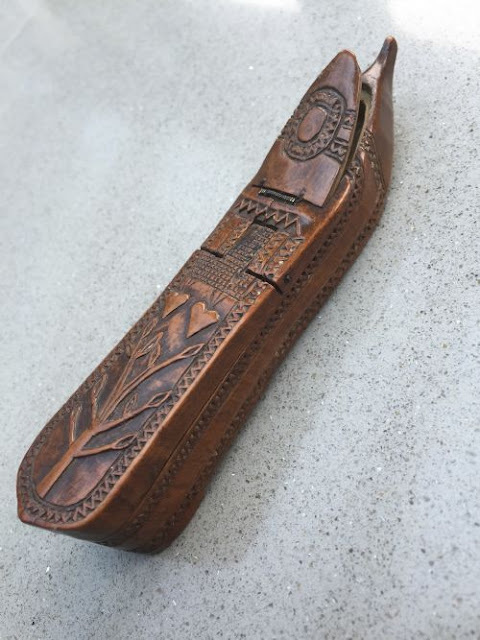 Given the chip carving, possibly Welsh. Or possibly French prisoner of war work. I will leave 5 and 7 for Rog. Mustn't be greedy, and besides, I don't know (again). P.s. Item 6. Or, possibly elsewhere. 1. I thought the materials were quite interesting, but is it a little man? 4. What type of gold-work & name of such irregular pearls, please? - Not a box - just a rich man's 'toy' in the old fashioned sense - possibly a gift to his wife upon the arrival of his heir. 6. Spot on as anticipated ~ I think I'd go for Welsh or Swiss in view of the 'two-hearts' motif. Cheers, Mike. Number (1) too dark for boxwood, so probably fruitwood - pear (?). The buttons, teeth, and possibly the collar of bone, perhaps. 7. A large wrench. Could be used by 19C AA men to remove or replace wheels on Carriages? ... or perhaps they are both snuff boxes? Absolutely spot on again Rog. 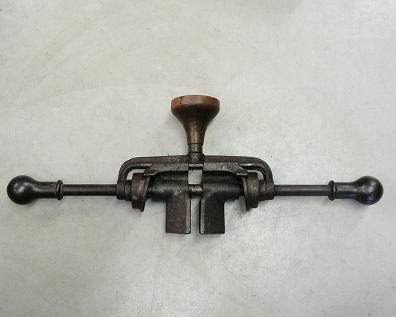 They are both snuff boxes or else one is a C.19th carriage wheel-nut wrench and the other is a Chinese straw chopping device - presumably to supply the brick-makers with chopped straw. 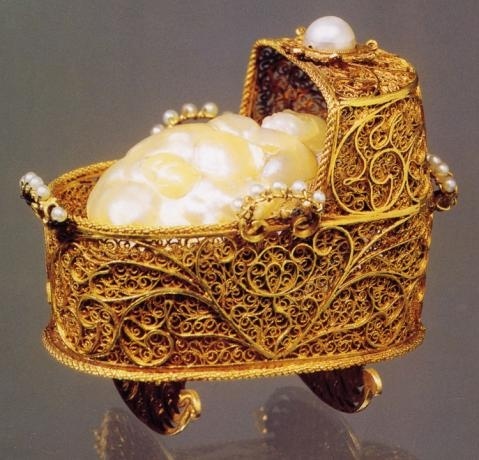 Yep, Mike, filigree work and the irregular pearls used to be known as baroque pearls. This one is particularly suggestive of a swaddled babe, look at the head. 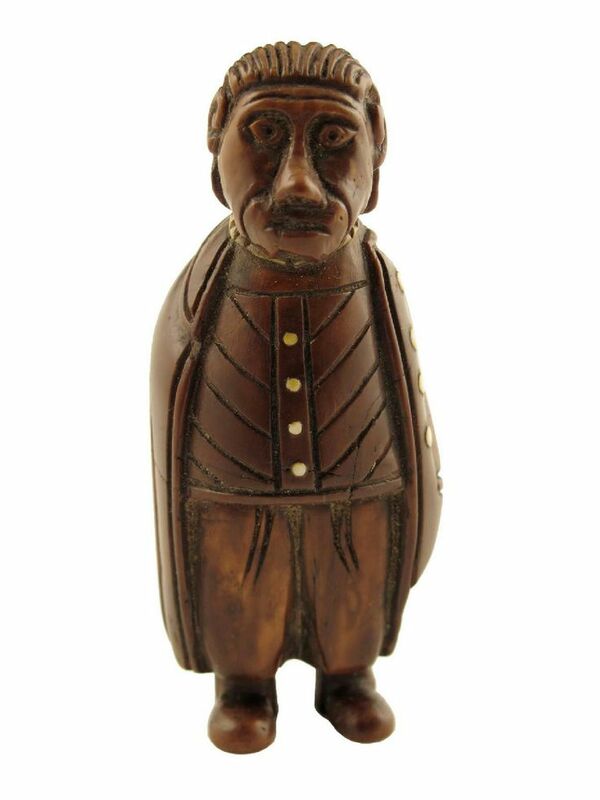 The small figural snuff-box is of coquilla nut and bone or possibly ivory ~ I've seen these figures decribed as monkeys. Considering the hair, snout and jowls on this box I think it was probably intended to be an anthropomorphized monkey. PS. Rog I didn't know Alcoholics Anonymous were so pro-active in the C19th as to pinch the coach wheels from suspected drunken coach-men.